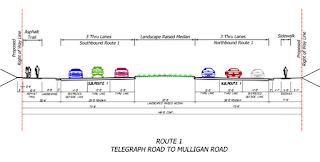 Federal Highway Administration is studying the widening of Route 1 from Telegraph Road to Mt. Vernon Memorial Highway. 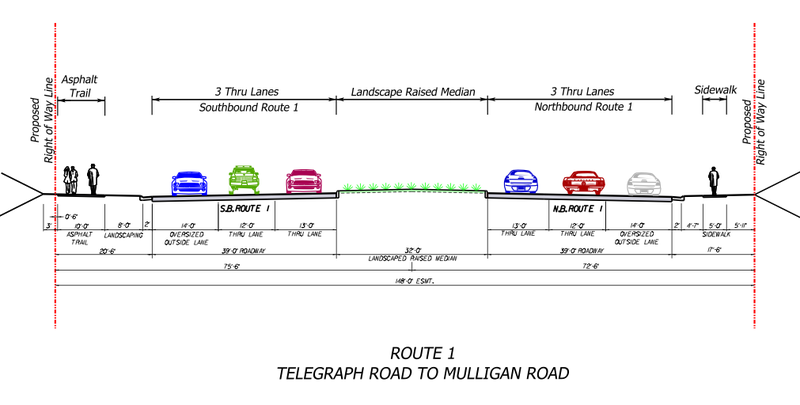 Current plans include wide outside lanes for use by bicyclists. There is opposition to the project that will impact Woodlawn National Historic Site. Often bicycle facilities are one of the first options to be cut from a widening project to reduce the overall width. See the proposed road profile (large pdf). All project documents on the FHWA website, including a summary of comments from the 2010 public scoping meeting that includes several references to the need for better bicycling facilities in the corridor. A public meeting on the project is planned for Tuesday, June 5, at Hayfield Secondary School, 7630 Telegraph Road, Alexandria, VA 22315, from 6-8pm. Cyclists need to attend the meeting and speak out for safe, convenient bike facilities as part of the Route 1 project. See a Patch article about the public meeting. "Route 1 as it is now is just not adequate for bicyclists," Belle View resident Mark Murphy said. "The curb lanes are narrow and traffic is heavy and fast. There are frontage roads along some parts of Richmond Highway, but they don't run consistently." "In my opinion, Route 1 should have striped bike lanes, but someone in VDOT did not want to promote bicycling on that high-speed roadway, and the 15 feet of space could readily be reallocated at a future time into an 11-foot travel lane plus a 4-foot bike lane," Allen Muchnick, Virginia Bicycling Federation board member. There is a 10 foot paved trail proposed for one side of the road but it does nothing for cyclists taking short trips along the opposite side of the road. Cyclists taking longer trips generally prefer an on-road route. According to Allen Muchnick of VBF, "Route 1 is of particular importance for bicycling nationally as a desired alignment for four long-distance bicycling routes: US Bicycle Route 1, the Adventure Cycling Association's Atlantic Coast Route, the Potomac Heritage National Scenic Trail, and the East Coast Greenway. Thus, providing first-class bicycling accommodations for all types of bicyclists is particularly important for this project." See other coverage of Route 1 topics on the FABB blog.